Previously filmed in 1926 as Red Dice, The Big Gamble stars future "Hopalong Cassidy" Bill Boyd as a heavily-in-debt gambler. 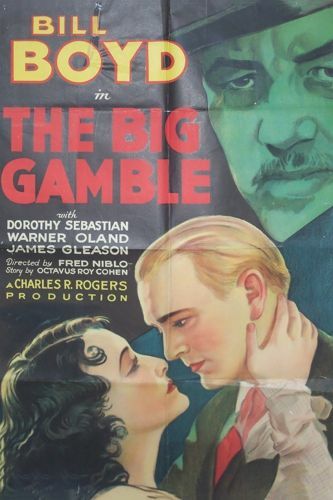 The suicidal Boyd makes a deal with mobster Warner Oland, whereby Oland will collect Boyd's huge insurance policy--provided he facilitates the gambler's entry into The Next World. When Boyd meets beautiful Dorothy Sebastian (then the actor's real-life wife), he finds a new reason for living. Oland, however, refuses to go back on the agreement, and proceeds with his plans to plant Boyd six feet under. The melodramatic elements of The Big Gamble are offset by the welcome comedy relief of James Gleason and ZaSu Pitts.